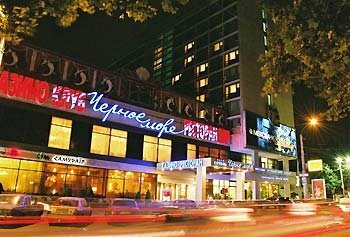 The Black Sea Hotel is situated in the historic central part of Odesa at the focal point of business activity, political and cultural life. Not far from the hotel there are: the railway station, the Opera House and one of the beaches belonging to the recreational zone of the city. Pushkinskaya street that passes near the hotel leads to Primorsky boulevard as well as to the City Hall and to the famous Potemkin Staircase. At the guests` service are 216 rooms of different categories including one-room Single and Double, one- and two-room Semi-Suites, two-room Suites and New Suites. All rooms feature telephones, TV-sets, air-conditioners, bathrooms or shower cabins. Superior rooms offer extra facilities: minibars, hair-dryers, cosmetics in the bathrooms. Guests are invited to visit the three restaurants of the hotel where meals of European, Ukrainian and Japanese cuisines are offered. At the banquet hall it`s possible to arrange a corporate party, to hold a business conference, to celebrate a family holiday. After a long working day guests can have a rest at the Black Sea entertainment complex, which seems to be a classical combination of rest, gambling and entertainment. The complex includes a casino, a bar, a restaurant and a night club. The fitness centre of the hotel offers a swimming pool, a gym, a small gym for groups, a massage room, a solarium, a sauna, a sport bar and a nursery. The Black Sea Hotel provides guests with a full range of business services. Professional technical equipment is available. The personnel of the business centre, which is located on the second floor, will help to send a fax message, to print or scan a text, to use a copying machine, to get access to the Internet. At the guests` disposal is the DHL express mail. At the business centre it`s also possible to rent a car, buy railway, bus or air tickets, book tickets to any theatre of the city. Qualified translators and interpreters are also at the clients` service. Other services of the hotel include: excursions organization, car rent with a driver, a parking lot, a luggage room, a beauty parlour, currency exchange, a souvenir shop.